In Yup’ik lore, the crane—depicted in the mask above—connotes stealth, power, and insight. The human face on the bird’s belly represents its yua, or spirit—the part of the animal that understands, and can relate to, humans. The porcelain “teeth” that border the face are a reminder to use one’s innate gifts to good effect, or risk being consumed by them. The porcelain “bones” hanging from the wings ward off evil spirits; wooden rings represent this world and the spirit world. 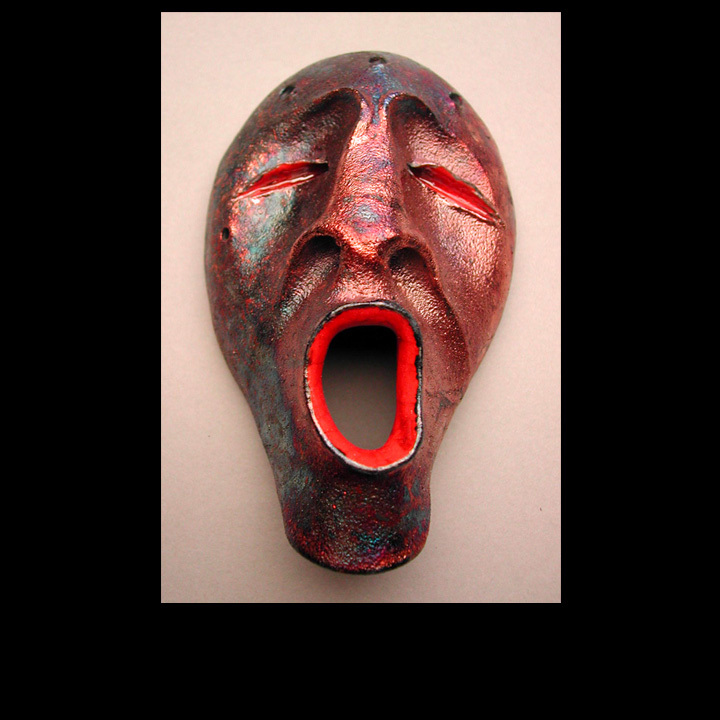 The mask shows the metallic effect produced by raku glazing. The singing spirit, a common motif in Charette’s work, represents a Yup’ik view of the life cycle: as mortals rejoice at a new birth, the spirit world mourns the loss of a friend; when earthly life ends and that spirit rejoins its friends, spirits rejoice as mortals grieve. 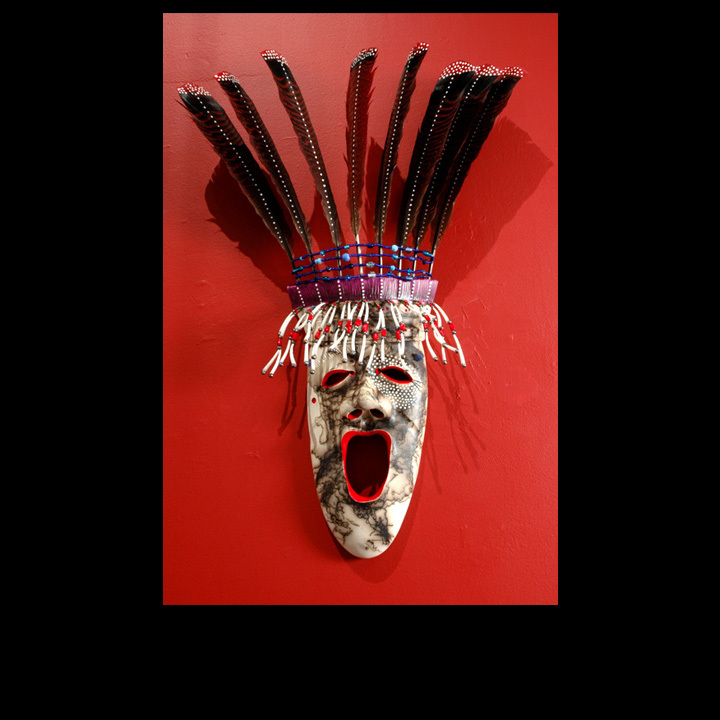 Charette traveled to the Smithsonian Institution in 2003 to view the museum’s Yup’ik holdings; the mask above, from his Poisoned series, shows that trip’s influence and comments on the way museums handled Native American art objects, many of which have sacred value. Charette saw many Yup’ik masks that had been treated with arsenic as a pesticide when the museum acquired them, then further defiled by stamping them with the word “poisoned” once the dangers of topical exposure to arsenic became known. In Yup’ik lore, the walrus connotes strength. In this dance mask, the smaller mask over one eye represents the walrus’s yua, or spirit. The other spirit masks and the lines of white dots represent ancestors and descendants, the family bloodline. The leather straps hanging down would attach the mask to the wearer’s head. The Arctic Dancer mask demonstrates Charette's "horsehair firing" technique, which entails heating clay to 1,800 degrees Fahrenheit and dropping individual hairs onto it to produce a streaked effect. White "stars" around one eye represent a connection to the spirit world; below the other eye is a mole. Yup'ik lore holds that people with a mole near the eye are endowed with spiritual vision; Charette has a mole in the same spot, and uses the mark in his art as a signature. The crane is a meaningful animal in Yup'ik lore and for Charette personally (see first image in this slide show). 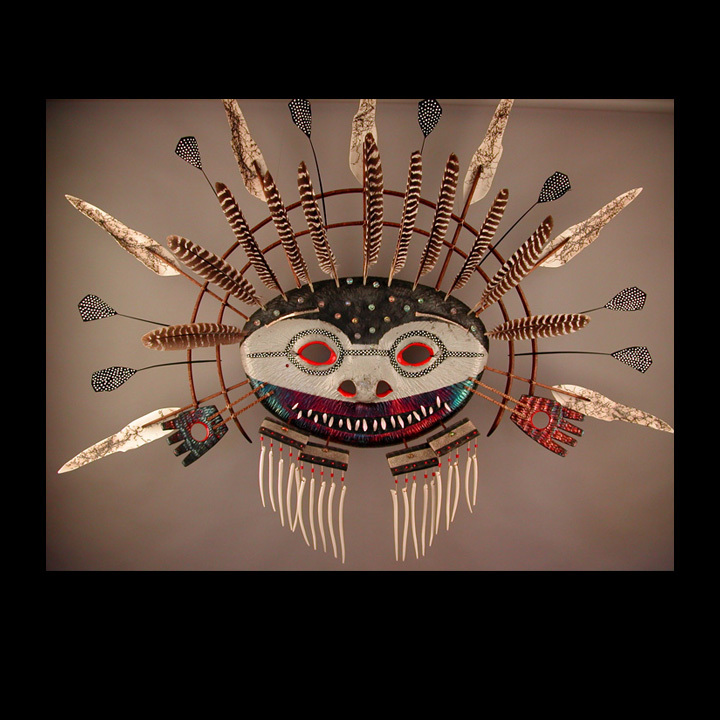 This four-foot-tall mask, from an Oregon art gallery, features a full crane face and head on top, and a human-like face on the animal's body to represent its yua. 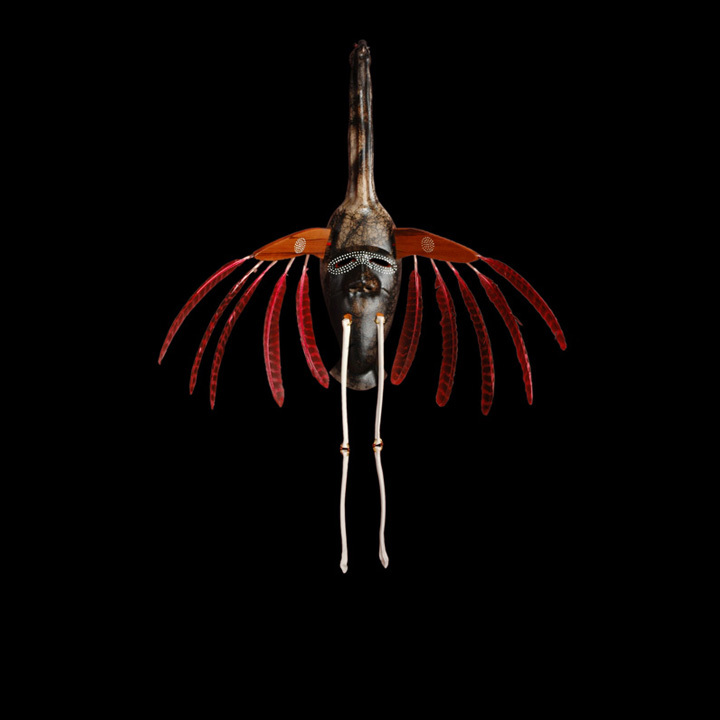 This mask, from Charette's Transformation series, is made of horsehair-fired clay, with porcelain "bone" legs and wild-turkey feathers in place of the raptor features used in Yup'ik masks of old. View images of Phillip Charette's masks  alongside masks from the Smithsonian Institution holdings that inspired him. Twelve years ago, Phillip Charette, M.Ed. '94, spent his days in an office, handling visa applications and other logistical concerns for international students, faculty, and staff at the University of Wisconsin-Madison. Now he makes his living as an artist, crafting sculptures that combine elements of his Native Alaskan heritage with his own modern touches. Charette's French-Canadian last name comes from his father, but his mother is full-blooded Yup'ik, an indigenous group that today has an estimated 21,000 members spread across Alaska and Siberia. He grew up in Florida, but spent summers with his grandparents in Alaska; Yup'ik was his first language, and he was always interested in Yup'ik folklore. "When I was very young, I was kind of an odd duck," he says. "When all the other kids were outside running around, I would be inside listening to the elders tell stories." As a boy, he was drawn to art, but his father, a federal agent, hoped that his son would choose a career with more financial security. 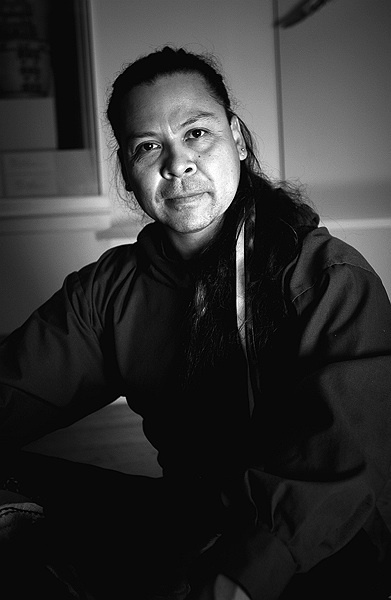 So Charette pursued education administration, and managed to incorporate his interest in his Yup'ik roots: he worked at the University of Alaska, helping to develop a K-12 curriculum combining traditional and Western knowledge. He entered Harvard three years after finishing his undergraduate education; equipped with a master's degree, he saw his path leading to higher levels of university administration. A 1997 medical appointment changed his course. Working 12 to 17 hours a day at the Wisconsin job, Charette recalls, left him feeling even more exhausted than anyone on such a schedule might expect. Though all the tests came back negative, Charette's doctor suspected his high-stress lifestyle would eventually make him sick: "He told me I would die of heart attack or stroke within five years," Charette says. He quit his job the next day. Soon after, his then-wife got a job in eastern Oregon, where Charette still lives. While substitute teaching and mulling his next step, he enrolled in a pottery class and began to explore what would become his trademark style: pieces reminiscent of historical Yup'ik masks, but made from clay--the medium that appealed most to him--instead of wood. 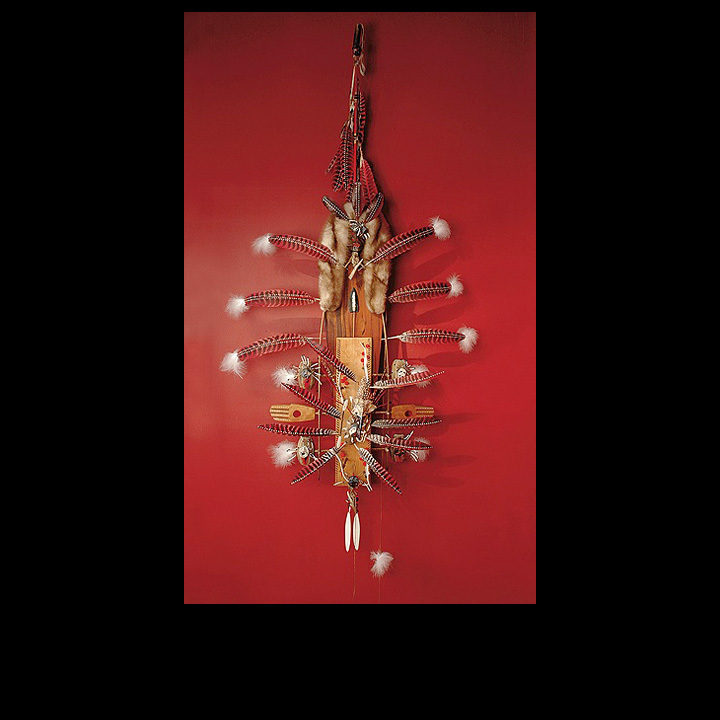 Since then, his work has won prestigious awards and been featured in a 2008 traveling exhibit of contemporary Native North American art. 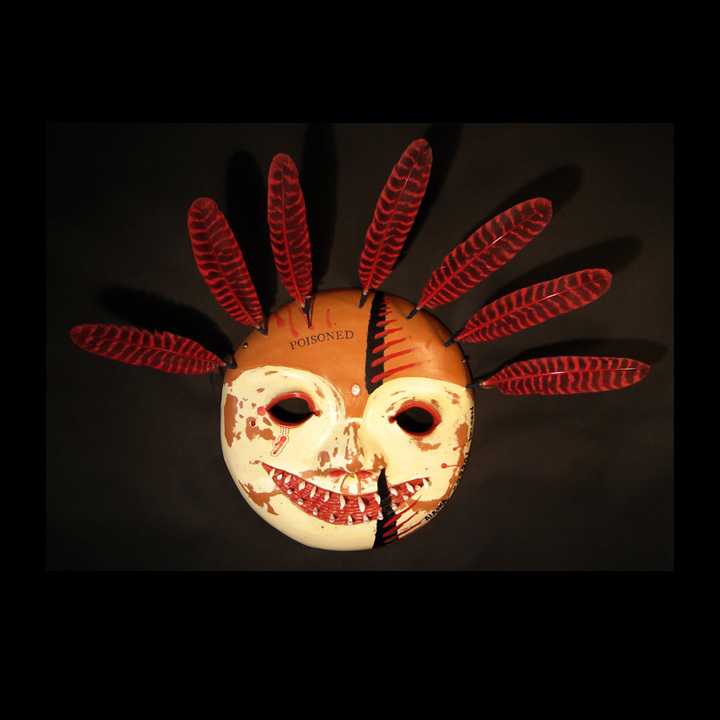 His masks explore concepts such as the afterlife and the spirit world, Yup'ik mythology, family stories, and cultural commentary. "Phillip doesn't simply copy the historic masks," says the Montana Historical Society's Bill Mercer, who acquired one of Charette's masks for the Portland [Oregon] Art Museum when he was curator for Native American art there. "It's this wonderful, contemporary, updated version, transforming them into art but maintaining their sense of spiritual potency." Like older masks found in ethnology museums, Charette's masks have a broad range of meanings and purposes. Some express ritual power; others are more like entertainment, encapsulating stories. "Just imagine that you don't have any media--no television, nothing," says Charette. "This was the media format" for the Yupiit. "Into it go stories, values, all the cosmology. It becomes a mnemonic device, the visual cue that helps you retain the knowledge." Charette often performs traditional Yup'ik songs and dances when he lectures. 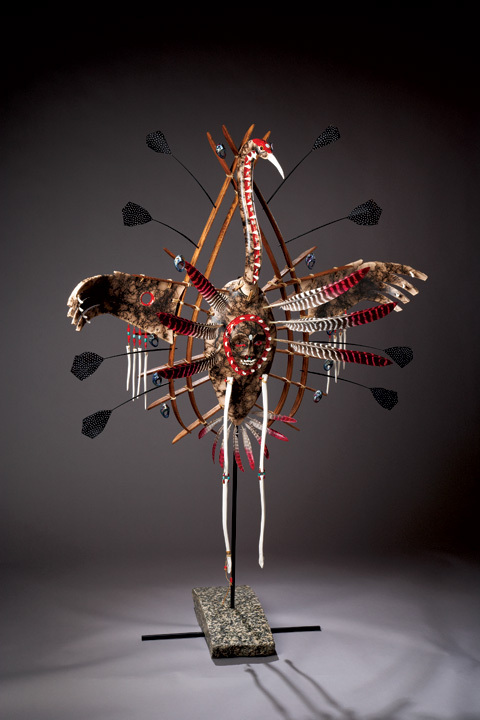 He also explains the meaning of the symbols in his work, shares insights from his research in the Smithsonian Institution's Native American collections and elsewhere, and draws analytic comparisons to other artistic traditions. In this approach, he sees the imprint of his time at Harvard--and his interest in academia is not altogether defunct: he hopes to earn a master's in fine arts and teach at the college level. He makes his art in Baker City, a community of 10,000 on the historic Oregon Trail. The rural environment suits him. When he lived in Portland, the dense smoke produced by raku glazing (a technique of Japanese origin that uses extremely high temperatures and incorporates minerals to form a metallic finish) and horsehair firing (heating porcelain to 1,000 degrees and dropping individual hairs onto it to burn a pattern into the surface) irritated the neighbors. Charette sees himself as a conduit, more than an artist giving life to his own vision. "The pieces shape themselves," he says. "Sometimes it just happens, and I can't tell you how or why." 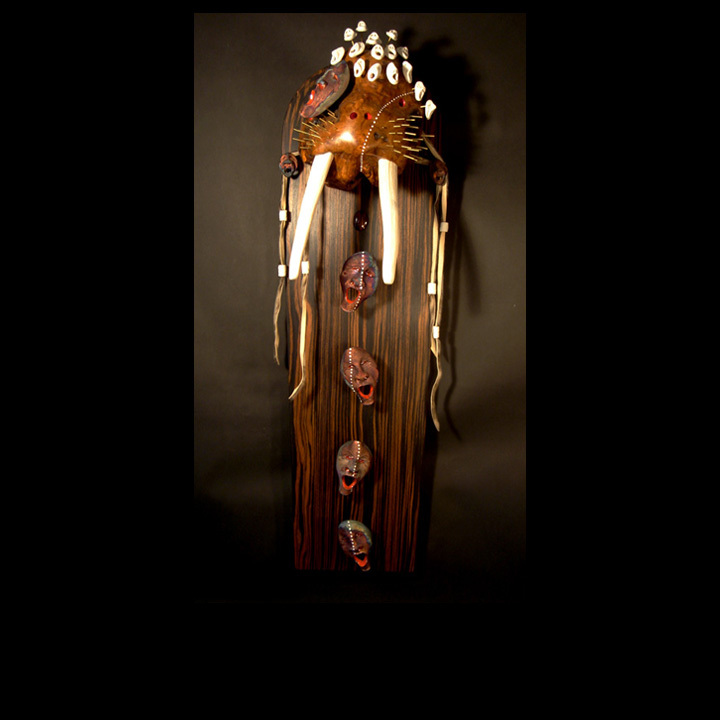 To view more images of Phillip Charette's art and find out where to see his works and hear his musical performances, visit his website, www.yupikmask.com .